Just another day in Hueville. 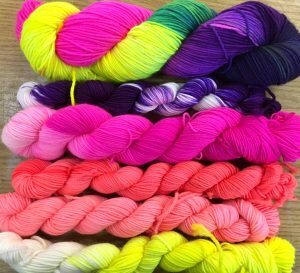 You know it’s time to pull your head out of the dye pot and post a few pics or words on social media when your knitters start emailing to make sure you are ok. I am fine! I promise. Well… to be honest I am seriously tired and my body is not real thrilled with me at this moment but all is well. Just super busy dyeing everyone’s yarn so you and our LYS’s can have it as soon as we can dye and dry it! 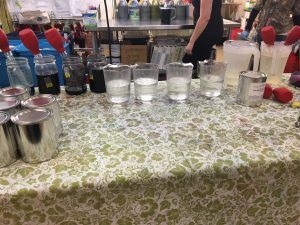 Which means my friends this post will be super short so I can head back out to the dye barn to rinse out yesterdays dye-fest and light the posts and get going with another day in Hueville. Look at all of this Heckley Speckley goodness! I love how the dye plays out on the different bases. There are three bases here. Plushy, Super Sparkle and La Luna Lace. 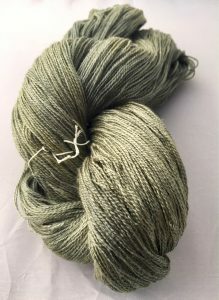 La Luna Lace is not superwashed treated like the other two and you can so see that difference here. Speckles hold more true on superwash treated yarns because they set almost as soon as they hit the yarn because of that nylon polymer coating. You can try for the same effect on nonsuperwash yarns with heat and more acid but it still dissipates a bit. I appreciate the difference. You can see it here even more distinctly. The La Luna is most definitely more muted. 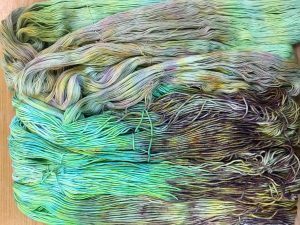 Now some of that is the silk but most of it is that superwash also gives a super saturated color effect!! I believe this colorway is Sunnydale. We’ve been dye testing neons this week for some upcoming colors and fun! 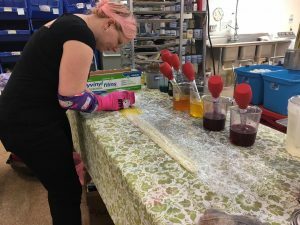 That’s Maggie our dye test queen! 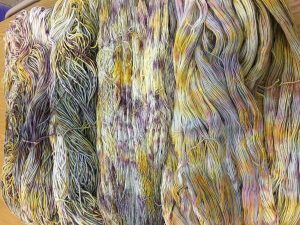 We always test new batches of dye when they come in the door as we do with new lots of yarn to make sure they are what we ordered and they match the last batch or lot. Maggie loves this job which is all kinds of awesome because I most definitely do not! We are working on all kinds of new colors and color themes and next years sock club and special colors for our LYS’s. As we were putting a yarn shipment away this week I noticed we have quite the stock of Marine Silk Lace. At this point in the year we are trying to keep stocks low for inventory so…we are putting it on SPECIAL for 29.00 a skein which is about 20% of it’s usual 35.00. It truly is a lovely lace weight yarn so if you need a treat this is a good one! Such a soft, light and lofty yarn with the perfect amount of drape! oh…it also takes the dye in a dreamy muted way that shows the layers of a color. Here it is in our Fir-Ever-Green colorway. The week after Thanksgiving we will be shipping out our last Targhee lesson of our first semester. That went fast and has been all kinds of fun. I hope you all are enjoying it as much as we are working on it. Truly a labor of love!! The only thing I feel sad about was that I have been so busy with the running and dyeing of things i have not had much of a chance to check in on our rav group. Luckily our swatch mistress and all around knit guru Karen has filled that role in a grand and graceful Karen way! If you have been wishing you had purchased it or waiting to see what the fuss was all bout well now is you last chance to purchase semester #1 November 31st is the last day you will be able to purchase it. One of other things we have been working on is the closing of this year’s Rockin’ Sock Club and the planning of next years!!!! It’s always sad for me to see a sock year end and I think this year I have found a way to process it for all of us so do check out the dyer’s notes!! We will be shipping out the week after Thanksgiving. Yay!!! So much shipping! I sent out an email yesterday to the club because we have most of our designers for the year on board. I will tell you that I am so very happy that we get to work with such talented designers. 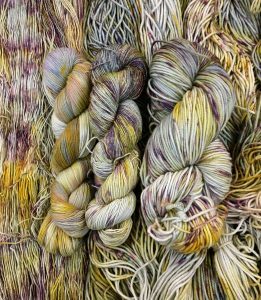 Designers who are as serious about sock knitting as we are, like: Ann Budd, Hunter Hammersen, ErinB, Meaghan Schmaltz and our very own Karen Alfke just to name drop a few. There are a few more and a cloaked in mystery extra special surprise designer!! Almost all of the patterns will be new and exclusive for a 3 month period so that worked really well!! Thanks for all of your feedback on making this change. 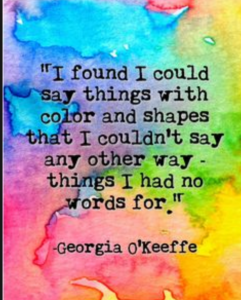 Wait until you see January’s colors. Oh my goodness!!! Okay well it is now 7:30 and I hear the yarn calling my name. You all hear that too right?? We will be closed Thanksgiving Day and the day after.